Dec 3, 2017 - All of these findings indicate that nano form of silver is less toxic to ... 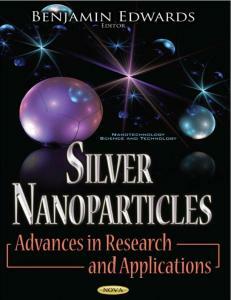 Among the different available NPs, silver nanoparticles ...... ing machine. Concept of reduction in particle size of metals is prevailing since Charaka Samhita (1500 BC). A metallic preparation,. (a rejuvenating formulation in which iron is. Shrivastava S, Bera T, Roy A, Singh G, Ramachandrarao P, Dash D.Characterization of enhanced antibacterial effects of novel silver nanoparticles. Sep 25, 2014 - the life sciences especially biomedical devices and medicine. Nanoparticles exhibit ... plants. Nanoparticles of Ag, Ni, Co, Zn, and Cu have also. May 17, 2017 - Cheol-Yong Hwang, DVM, PhD, e. Yong-Kwon Kim, PhD, f. Yoon-Sik Lee, PhD, g. Dae Hong Jeong, PhD, b,. 4 Myung-Haing Cho, DVM, PhD a.
Mar 15, 2017 - silver nanoparticles in AgNPs groups (especially 0.08 mg kg-1) improved wound .... homogeneous tissue 1:10 (0.10 + 0.90) was placed in the. 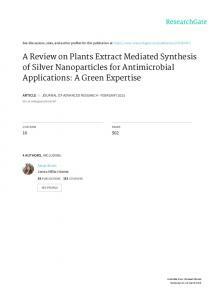 asiatica and Citrus sinensis was used for the synthesis of silver nanoparticles (Ag NPs) from silver ... Production and hosting by Elsevier B.V. All rights reserved. Jul 20, 2016 - Simferopol, Russia. Tel: 3652554940. Citation:Kubyshkin A, Chegodar D, Katsev A, et al. 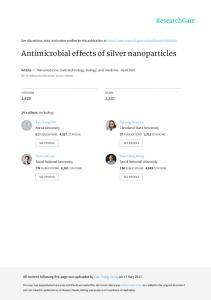 Antimicrobial Effects of Silver Nanoparticles. the field of toxicity of CuO NPs on cultivated plants. This review article ... textiles, medicine, catalysts, water treatment, and environmen- tal remediation [1â5]. Jul 8, 2016 - Toxicological Effects Induced by Silver Nanoparticles in Zebra. Fish (Danio Rerio) and in the Bacteria Communities Living at Their Surface. Figure 1. UV-Visible absorption spectrum of silver nanoparticles immediately after preparations. 192 Int. Res. J. Biotechnol. Table 1. Effect of silver nanoparticles on shoot ant root lengths of Phaseolus vulgaris and Zea mays. Note: The mean difference is significant with P ˂ 0.05.
nanotechnology. According to the manufacturer, the particle size ranged from 10 to 30 nm (average 20 nm) and spherical in shape. Particles size and morphology were characterized by UV spectral analysis, as shown in Figure 1. The experimental design was randomized complete block design with three replications. The test species were common bean (Phaseolus vulgaris) and corn (Zea mays) and chosen as biological material considering its economic importance for agriculture and foods. Seeds of plant materials of Phaseolus vulgaris and Zea mays were obtained from the Agriculture Research Centre Giza, Cairo, Egypt. Seeds were sterilized in a 5% sodium hypochlorite solution for 10 minutes (USEPA, 1996), rinsed through with deionized water several times. Their germination was conducted on water porous paper support in petri dishes (25 seed per dish) at controlled temperature of 25 ± 1 ºC, and stored in a dark container. After 24 h. the seeds were checked for germination and the sprouted seeds were used in the tests. Healthy and uniform seedlings were allowed to grow in pots. The pots of 14 cm diameter and 18 cm in height were filled with fertile loam soil up to ¾ the height of the pot. Daily supply with 15 ml silver nanoparticles per every test plantlets was carried out for 12 days along with control. Plant growth being conducted in controlled conditions of temperature (25 ± 1 ºC) illumination (dark/light cycle: 14/10 h.) and 80% humidity into a green house of Botany Department, Faculty of Science, King Saud University. Silver nanoparticles were added daily in different concentrations (20, 40, 60, 80 and 100 ppm) for each test plants. Each concentration was prepared in three replicates. After 12 days of growth, the shoot and root lengths were long enough to measure using a ruler. Fresh and dry weights were measured, leaf surface area were measured using portable area meter Model L1 3000. Chlorophyll A, chlorophyll B and carotenoid pigments were accomplished based on method of Stirban (1985), carbohydrate content was measured according to Nelson (1944) and Somogyi (1952). Protein content was measured according to Lowry et al. (1951). Table 2. Effect of silver nanoparticles on fresh ant dry weights of Phaseolus vulgaris and Zea mays. Table 3. Effect of silver nanoparticles on leaf surface area of Phaseolus vulgaris and Zea mays. 194 Int. Res. J. Biotechnol. Figure 2. Effect of silver nanoparticles on chlorophyll content (mg/g) of Phaseolus vulgaris and Zea mays. Figure 3. Effect of silver nanoparticles on carbohydrate content (mg/g) of Phaseolus vulgaris and Zea mays. 196 Int. Res. J. Biotechnol. nanocalcium carbonate caused increasing soluble sugar and peanut protein. The results showed that the effect of silver nanoparticles on protein content of common bean (Phaseolus vulgaris) and corn (Zea mays) was significant (Figure 4). Application of silver nanoparticles at the concentration of 20, 40 and 60 ppm caused an increase in protein content of the two tested crop plants. At 60 ppm concentration the maximum significantly increase in protein (30% for common bean and 24% for corn) over control. At a dose of 100 ppm, significantly decrease in the protein (32% for common bean and 18% for corn) over control. The increase in protein at certain concentration suggests the optimum dose limit for the growth of common bean and corn plants. However, the decrease in protein beyond this concentration suggests the toxic effect of AgNPs. The same results were obtained by Liu et al. (2005). CONCLUSION The present study demonstrated the effect of silver nanoparticles on crop plant species common bean (Phaseolus vulgaris) and corn (Zea mays). The presence of AgNPs affects growth of common bean and corn at different concentrations. The maximum effect was found at 60 ppm for the two crop plants. Beyond this concentration the growth was inhibited. The effective growth at certain optimum concentration and inhibited growth beyond this concentration may be attributed to the accumulation and uptake of AgNPs by the roots. It was found that the accumulation and uptake of nanoparticles was dependent on the exposure concentration. 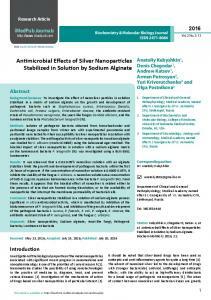 related nanosilver toxicity to nitrifying bacteria. Environmental Science Technology, 24: 4583 – 4588. Choi O, Deng KK, Kim NJ, Ross Jr L, Surampalli RY, Hu Z (2008). 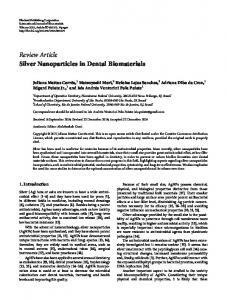 The inhibitory effects of silver nanoparticles, silver ions and silver chloride colloids on microbial growth. Water Res., 42: 3066 - 3074. Gao F, Liu C, Qu C, Zheng L, Yang F, Su M, Hong F (2008). Was improvement of Spinach growth by nano – TiO2 treatment related to the changes of Rubisco activase. Biometals, 21: 211 – 217. Harajyoti M, Ahmed GU (2011). Phytotoxicity effect of silver nanoparticles on Oryza sativa. Int. J. Chem. Tech. Res., 3(3):14941500. Hong F, Yang F, Liu C, Gao Q, Wan Z, Gu F, Wu C, Ma Z, Zhou J, Yang P (2005a). Influence of nano-TiO2 on the chloroplastaging of Spinach under light. Biological Trace Element Research, 104: 249 – 260. Hong F, Zhou J, Liu C, Yang F, WU C, Zheng L, Yang P (2005b). Effects of nano-TiO2 on photochemical reaction of chloroplasts of Spinach. Biological Trace Element Research, 105: 269 – 279. Karthick S, Chitrakala K (2011) Ecotoxicological effect of Lecani cilium Lecanii (Ascomycota:Hypocereales) based silver nanoparticles on growth parameters of economically important plants. 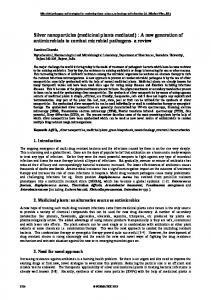 Journal of Biopesticides, 4 (1): 97 – 101. Khanna, PK, Singh N, Kulkarni D, Deshmukh S, Charan S, Adhyapak PV (2007). 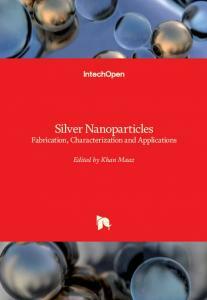 Water based simple synthesis of redispersable silver nano-particles. Materials Letters, 61: 3366 - 3370 Lin D, Xing B (2007). Phytotoxicity of nanoparticles: inhibition of seed germination and root growth. Environmental Pollution, 150: 243 250. Lin D, Xing B (2008). Root uptake and phytotoxicity of ZnO nanoparticles. Environmental Science & Technology, 42: 5580 – 5585. Liu XM, Zhang FD, Zhang SQ, He XS, Fang R, Feng z, Wang Y (2005). Effects of nano – ferric oxide on the growth and nutrients absorption of peanut. Plant Nutr. and Fert. Sci., 11: 14 – 18. Lowry OH, Rosebrough NJ, Farr AL, Randall RJ (1951). 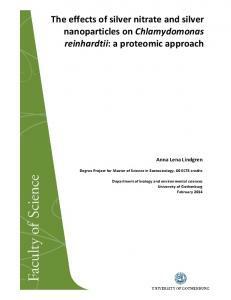 Protein measurement with the folin phenol reagent. Jour. Biolog. Chemisrty, 193: 265 – 275. Lu CM, Zhang CY, Wen JQ, Wu GR, Tao MX (2002). 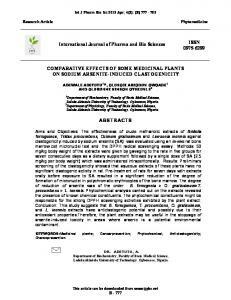 Research of the effect of nanometer materials on germination and growth enhancement of Glycine max and its mechanism. Soybean Sci., 21: 168 -172 Mahajan P, Dhoke SK, Khanna AS (2011). Effect of nano – ZnO particle suspension on growth of Mung (Vigna radiata) and Gram (Ccicer arietinum) seedling using plant agar method. Jour. of Nanotechnology, 1(1): 1 – 7. Meyer NJ, Christopher AL, Xinyu YY, Elena AT, Appala RB, Stella MM, Ashutosh C, Mark RW, Melanie A (2010). Intracellular uptake and associated toxicity of silver nanoparticles in caenorhabditis elegans. Aquatic Toxicology, 100: 140 – 150. Mihaela R, Dorina EC (2007). TMA–OH coated magnetic nanoparticles internalizes in vegetal tissue. Rom. Jour. Phys., (52): 395 -420 Nel A, Xia T, Madler L, Li N (2006). Toxic potential of materials at the nanolevel. Science, 311: 622 – 627. Nelson N (1944) Aphotometric adaptation of the Smogyi method for the determination of glucose. Jour. Biolog. Chemistry, 153: 375 – 380. Novack B, Bucheli TD (2007). 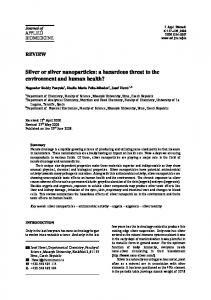 Occurrence, behavior and effects of nanoparticles in the environment. Environmental pollution, 150: 5 – 22. Oprisan MU, Ecaterina F, Dorina C, Ovidiu C (2011). Sunflower chlorophyll levels after magnetic nanoparticle supply. Afric. Jour. of Biot., 10 (36): 7092 – 7092. Racuciu M, Creanga D (2009). Bio Compatible magnetic fluid nanoparticles internalized in vegetal tissue. Rom. Jour. Phys., 54: 115 – 124. Racuciu M, Creanga D, Olteanu Z (2009). Water based magnetic fluid impact on young plants growing. Rom. Rep. Phys., 61 (2): 259-268. Roco MC (2003). Broader societal issue on nanotechnology. Journal of Nanoparticle Research, 5: 181 – 189. Seif SM, Sorooshzadeh A, Rezazadehs H, Naghdibadi HA (2011). Effect of nanosilver and silver nitrate on seed yield of borage. Jour. Medic. Plant Res., 5 (2): 171 – 175. Sheykhbaglou R, Sedgh M, Tajbakhshshishevan M, Seyedsharifi R (2010). Effects of nano – iron oxide particles on agronomic traits of soybean. Not. Sci. Biol., 2 (2): 112 – 113. Somogyi M (1952). Note on sugar determination. Jour. Biolog. Chemistry, 185: 19 – 25. Stirban M (1985). Procese primare in Fotosinteza ( in Romanian), Ed. Didact. Sipedag., Bucharest, Romania, P. 229. U. S. Environmental Protection Agency (USEPA) (1996). Ecological effects test guidelines: Seedgermination/root elongation toxicity test, OPPTS 850. 4200. EPA 712-C-96-154. Washington, DC. Yang F, Hong FS , You WJ, Liu C, Gao FQ , Wu C, Yang P (2006). Influences of nano-anatase TiO2 on the nitrogen metabolism of growing Spinach. . Biological Trace Element Research, 110: 179 – 190. Yu-nam Y, Lead R (2008) Manufactured nanoparticles: an overview of their chemistry, interactions and potential environmental implications. Science of the Total Environmental, 400: 396 – 414. Zheng L, Hong F, Lu S, Liu C (2005). Effect of nano – TiO2 on strength of naturally aged seeds and growth of Spinach. Biolo. Trace Element Res., 104 (1): 82 – 93. 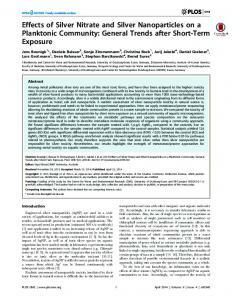 Report "Effects of silver nanoparticles in some crop plants ..."